After trying and liking what I discovered to be overripe feijoa, I was eager to get my hands on a perfectly-ripe one to see how it was supposed to taste. I started stalking the produce aisle (not for the first time), but the feijoa never reappeared. However, my disappointment turned to glee when I spotted something different where the feijoa had been.... rambutan!! 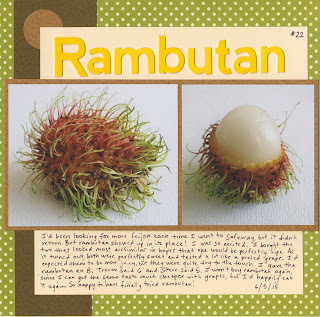 I'd had rambutan on my must-try list for years. I'd almost given up hope and was considering trying canned rambutan as part of 43 New-to-Me, but I knew that, at best, the canned version would pale in comparison to the fresh version. I'm so glad my patience was rewarded! I bought the two rambutan that looked the most dissimilar, hoping that one of the two was properly ripe. As it turned out, both were. They were delicious. The taste and texture were similar to a peeled grape, though not quite as moist. I gave rambutan an 8. Even though I really liked it, I won't be buying it again. Grapes are so similar, but much, much cheaper. New-to-me food #22, tasted, rated and scrapped! Last November, I reviewed the first two kids' craft books written by my very talented and creative boss, Amanda Formaro. Trevor and I loved both Rubber Band Mania and Duct Tape Mania. If you haven't checked them out already, I strongly encourage you to do so! 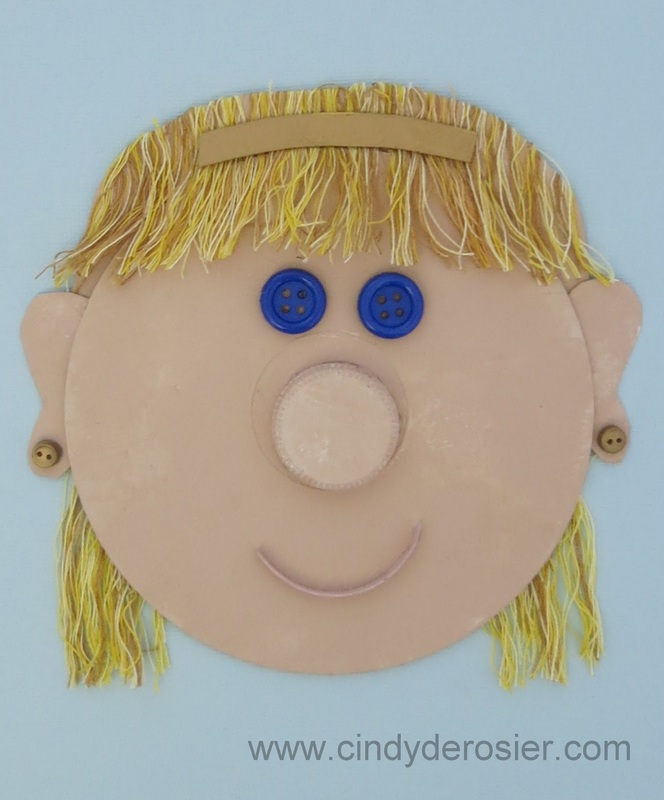 They are full of fun ideas for school-age boys and girls and would make a thoughtful and affordable gift. 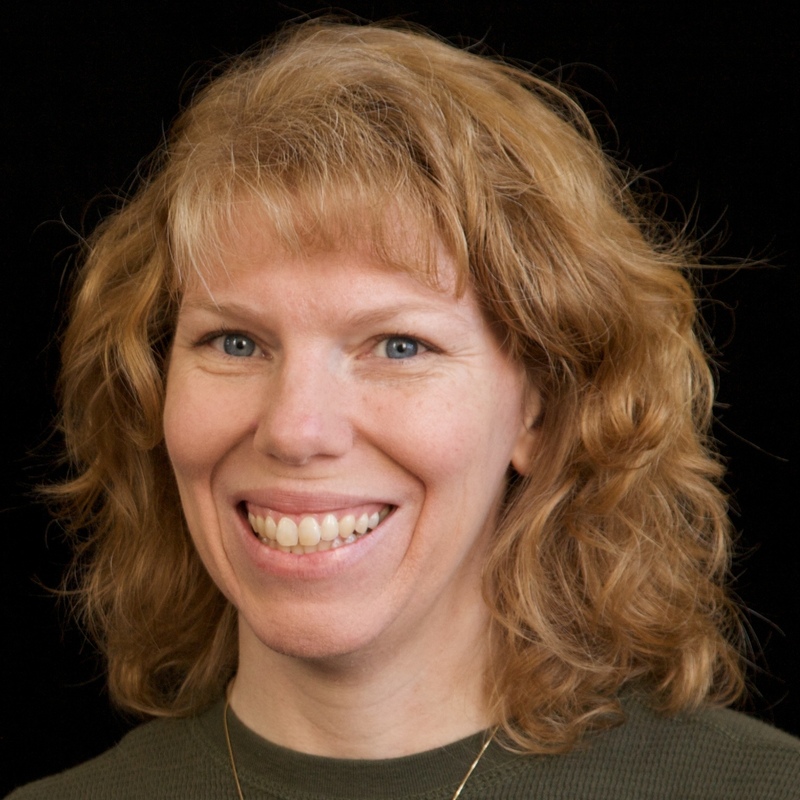 I don't know how she does it, but Amanda has written three more books since then! The publisher sent me advanced copies of all three. 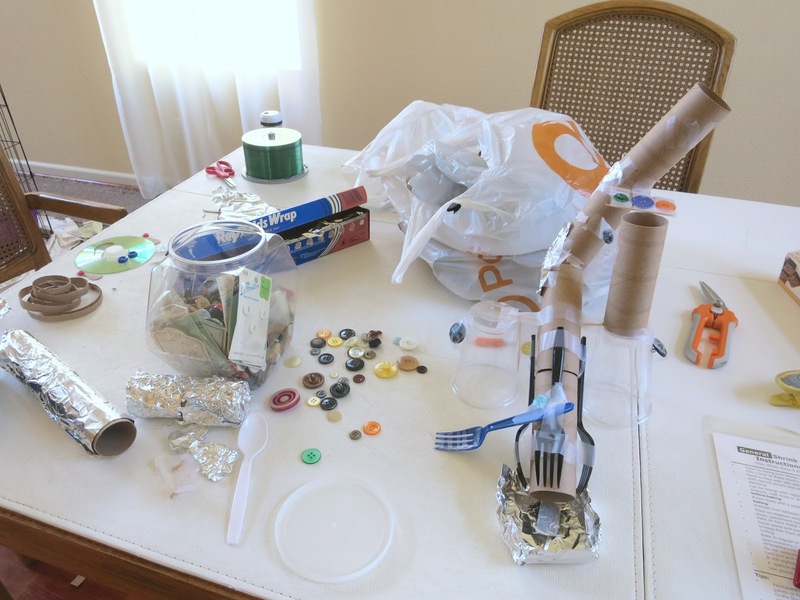 The first book I dove into was Button Mania: Buttons, Bottlecaps and Beyond! As before, I am reviewing this not out of obligation, but because I think you will love it as much as I do! This colorful book is chock-full of fun projects. I appreciate the clear directions and many step-out photos. 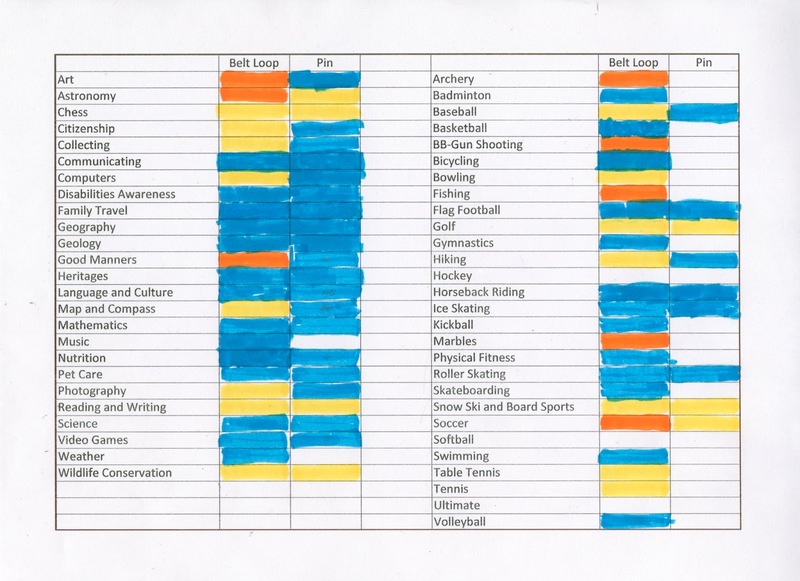 Each project has a supply list and is marked with a difficulty level. 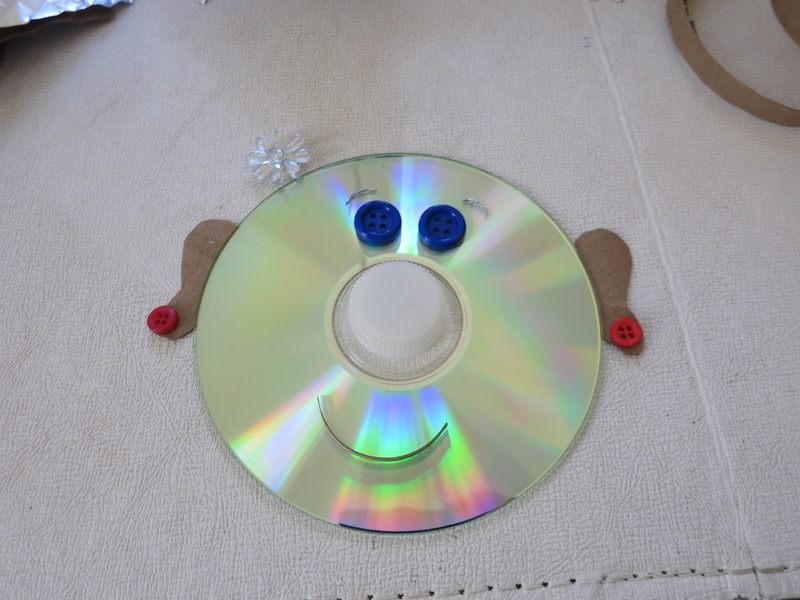 Button-themed tips, trivia and jokes are sprinkled throughout the pages. The book arrived just before Trevor's baseball practice. I couldn't wait to try a project, so I grabbed supplies for the Button Bracelet and brought them along with me to the field. I invited my friends and fellow baseball moms, Jenny and Rebecca, to join me in making bracelets. We had a great time stringing buttons, chatting and watching our kids practice. Steve was very helpful, both in taking photos of our crafting and in trying on my completed bracelet. 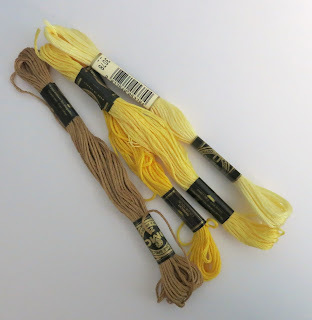 I'd brought along different types of cording to see how they would work, as Amanda's supply list said to use twine or cord. Jenny used cream embroidery floss with green, turquoise, brown and cream buttons to create a beautiful, layered bracelet. I used black waxed laces (left over from a leatherwork project Trevor made) with alternating white, red and blue buttons to make a patriotic bracelet. Rebecca used a stretchy red cord with red and pink buttons for her bracelet. The three cords yielded different looks. The embroidery floss was much more difficult to string, but the way Jenny overlapped the buttons was very pretty. My black laces were easy to string and added a contrasting design detail to the buttons. Rebecca's stretchy cord was easy to take on and off, but curled up and had to be straightened to look right. We had a great time and the 90 minute practice time was over before we knew it. Thanks to Jenny and Rebecca for playing along! They were both very impressed with Button Mania. We only came up with one critique and that is that the first chapter (Stuff to Wear) is entirely projects for girls (earrings, bracelet, locket, etc). 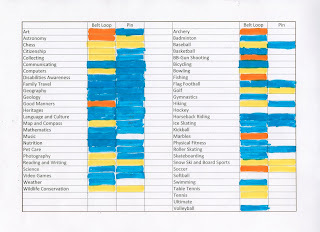 The remaining chapters (Stuff to Play, Stuff for Outside, Stuff for Noise, Stuff to Hang, Stuff for Fun, Stuff to Create and Stuff for Home) are great for both boys and girls. As the mom of a boy, if I were flipping through the book at the store and started at the beginning, I might not buy it, thinking it was mostly for girls. That is definitely not the case! Trevor has marked a dozen projects that he wants to try eventually. Button Mania is available for pre-order on Amazon (affiliate link below) and will be in stores in August. Check it out! You won't be disappointed. Ever since I started my 43 New-to-Me project, friends have been sending me suggestions of interesting foods to add to my list. My friend Izzy, who lives in North Carolina, has been especially determined to find a Southern delicacy for me to try. The first dozen things she mentioned I'd already eaten. I've traveled to the South a handful of times, plus I've had many friends over the years with a Southern background who have fed me random stuff. Then, of course, there was the time I tried making fried green tomatoes without ever having seen or eaten them. Apparently, it is very common in the South to open a glass bottle of Coke, take a swig, and then pour a packet of salted peanuts into the bottle. Check out this link from Coca-Cola itself, as well as this link from Serious Eats. And here's a fun link from Sprinkle Bakes. Izzy went on to suggest that I try an entire menu of Coke. How fun! I'm always up for a cooking challenge. When my friend Sheena's family came over for dinner, I pulled out the peanuts and the Coke bottles and was surprised when Sheena knew all about it. 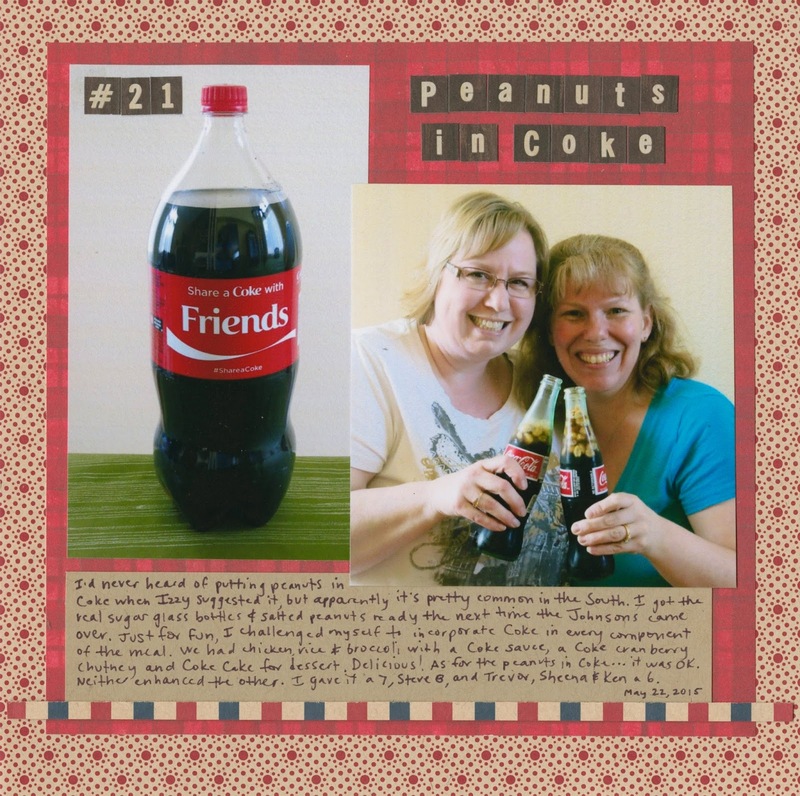 She'd never had peanuts in Coke, but it was something her mom used to do. Once the drinks were served, I plated up chicken, rice and broccoli with a Coke-pineapple sauce and an amazing Coke Cranberry Chutney. 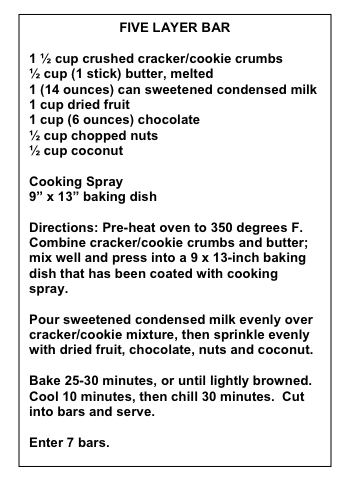 For dessert, I used this recipe for Chocolate Coke Cake. The cake and the chutney each deserve a 10 out of 10.... although I should have either served the chutney with a slotted spoon or added some thickener to it. But it was delicious with the chicken, rice and broccoli, so the extra juiciness was fine. As for the actual 43 New-to-Me item of peanuts in Coke, it was fine. I drank it all and tapped the bottle to eat the peanuts at the end as instructed. I didn't think either the Coke nor the peanuts were improved by being mixed together, but they weren't made worse either. I gave this combination a 7. Steve rated it an 8, while Trevor, Sheena and Ken each gave it a 6. It's been just over 3 months since I started my challenge and I'm at the halfway mark, not only with trying foods but with scrapping them too! It's been so much fun and I absolutely love the album. It's going to be great fun to look back on years from now. 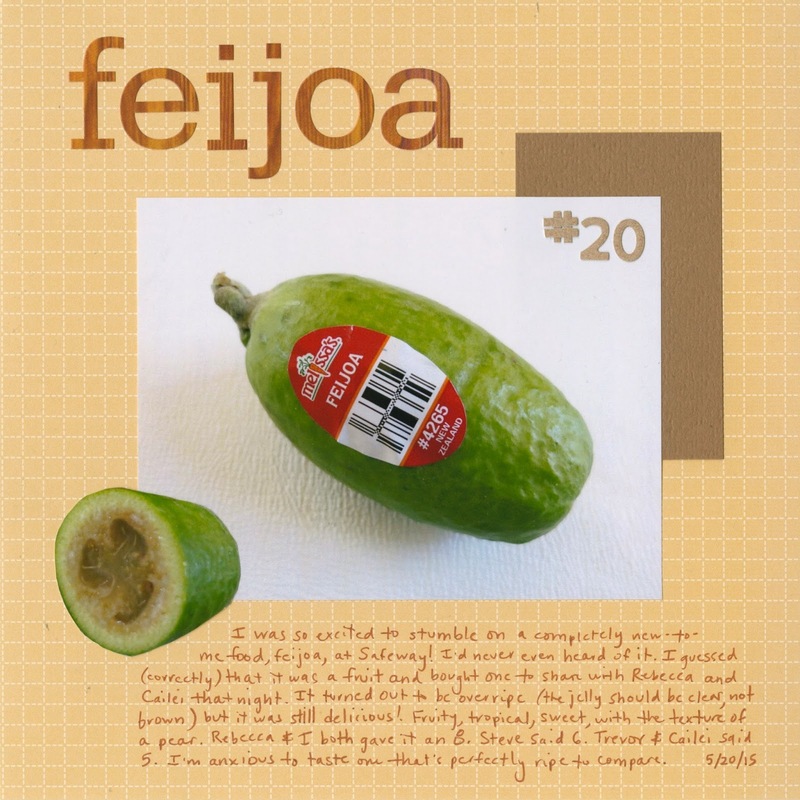 I was picking up produce at Safeway to make dinner for friends a few weeks ago when I spotted something I didn't recognize, called feijoa. It looked similar to an avocado, though a paler green and somewhat more oblong. I gave it a sniff and guessed (correctly, as it turns out), that it was a tropical fruit. I put it in my cart, thrilled to have stumbled on something that I'd not only never had, but never even heard of! Even the checker hadn't heard of it. She said it was the first time she'd ever seen one in her line. She had all sorts of questions for me about what it was, how it was prepared, what it tasted like, etc. I told her I had no idea, briefly explained 43 New-to-Me, and said I'd let her know how it was the next time I was in. I googled feijoa when I got home to figure out what to do with mine. This video was very helpful. Right before dinner, I pulled out the feijoa with much fanfare, cut it in half, and discovered that the one I'd bought was somewhat overripe. Drat. We ate it anyway and found that it was quite delicious! The texture was a bit grainy like a pear, while the flavor was sweet, tropical and fruity, with hints of strawberry and maybe papaya. I gave the overripe feijoa an 8, as did Rebecca. Steve gave it a 6, which is shocking considering he hates every tropical fruit except pineapple. Trevor and Cailei each gave it a 5. We were all eager to try the perfectly ripe version to see how it would compare. Alas, it was not at the store the next time I was there, nor in any visit since. I'm going to keep my eye out for it though! Last November, when my childhood best friend Nancy and her kids were visiting from Colorado, we held a cookie bake-off at our house. Nancy, Marco, Julia and Trevor were the contestants, while I played the roll of Tim Gunn, their culinary advisor. Steve joined us for the judging. It was so much fun that we decided to make it an annual(ish) event. When our family made plans for a June visit to Colorado, we all agreed that we simply HAD to have another cookie bake-off while we were there! Trevor got right to work creating a Perler bead prize for the winner, using his beloved glow-in-the-dark beads to spell out COOKiE on a trophy. As before, I made the base dough and divided it into four parts. The contestants drew numbers from a hat to determine their baking order. First up was Julia (age 8), the reigning champion. Julia went straight for the mint chocolate chips, having won last year's event with a mint-flavored cookie. She added another mint element, chunks of Andes Mints. She asked me to help her pound a chocolate See's lollipop into bits to add to the cookies. Next, she added mini marshmallow bits. So far, so good. Her final ingredient was a sprinkle of Rainbow Nerds. Tim Gunn cautioned her, asking whether fruit flavors and mint go together. She was confident that they did. At the very least, they added really pretty dots of color to the cookies, which she named "Creamy and Crunchy." Trevor (age 9) was the second baker. To my surprise, the first three ingredients he added (mint chocolate chips, mini marshmallows and Rainbow Nerds) were ones Julia had selected too. However, Trevor added significantly more of each ingredient, particularly the Nerds, than Julia did. His fourth and final ingredient was crushed mini Oreos. He named his cookie "Minty Deluxe." They had far less structural integrity than Julia's, a clear result of having equal parts dough and mix-ins. The third baker was Marco (age 10). He immediately reached for the Nerds and marshmallows and dumped in a significant amount of each. (Why am I not surprised that the kids all went straight for the purest form of sugar available?) Tim Gunn cautioned him not to add too many more mix-ins, as the cookies were already more candy than cookie. He sprinkled in a few Heath toffee bits and then asked me to smash up some Icebreakers Strawberry Sours. I was skeptical. Do fruity Nerds, marshmallows, and toffee need strawberry-flavored powder too? He was confident that they did. He named them "Another Very Good Cookie." Unfortunately, when Marco's cookies emerged from the oven, it was clear they had almost no structural integrity. I had to scrape them off the pan. I arranged them so that the least-mangled ones (those that actually resembled cookies) were on top. The fourth and final baker was Nancy (age 42). She regretted not following Tim Gunn's advice last time and was determined not to make the same mistake. She added butterscotch chips, white chocolate chips, macadamia nuts and a little bit of Heath toffee bits to her cookies. She was concerned that she had too many mix-ins for the amount of dough, but Tim Gunn reassured her that they would be fine. They were. She named them "Sweet Redemption." When all the cookies were cool and plated, we sat down for judging. One by one, each contestant introduced their cookie. This was the first that anyone (besides me) knew what mix-ins the others had chosen. Here is Trevor, talking about "Minty Deluxe." Here's Marco, describing "Another Very Good Cookie." Each judge scored the cookies on a scale of 1-10. The contestants graded their competitors' cookies, but not their own. This time, I clarified that I didn't want any fractional parts besides 1/2, having had to do far more math than I wanted to last time in order to deal with scores like 8.335 and 7 15/16. I tabulated the scores while the contestants went to the stew room. There was a clear winner. Trevor had requested that I cover the winning plate of cookies with a cloche and reveal it dramatically like Ted Allen does on Chopped. Due to the lack of cloches in the Salomone household, I hid the winning cookies under a dishtowel and called the contestants back to the table. Nancy's "Sweet Redemption" cookies were just that! She now holds the title until our 3rd Annual(ish) competition! Congrats to all the contestants for another great competition. When I blogged about trying Big Red soda for the first time, I certainly did not anticipate what would happen next! I got a comment on my blog from Amanda Fay at Big Red, asking me to get in touch. Turns out they have a program that generates a daily list of where Big Red is mentioned online. Their communications director saw my post and forwarded it on to Amanda, who offered to send me a different Big Red product to try. Exciting! Obviously, I said yes. I was very curious what she would be sending to me. The Big Red website shows four other flavors of soda (Big Blue, Big Manzana, Big Peach and Big Pineapple), in addition to a zero-calorie version of Big Red. Would it be one of those? Nope! It turned out to be the limited-edition "Vintage Reset" version of Big Red. The 18 oz. cans proudly proclaimed, "Made with real sugar." Intriguing! I'm a fan of sugar, so I was eager to try it. I still had a few cans of the regular Big Red from the pack I bought originally, so I decided to do a blind taste-test to see how the two compared. The first step was finding some eager volunteers to taste along with me. I brought both the regular and the vintage reset cans to a family gathering, where six people agreed to do the blind tasting. I prepared two sets of tasting cups, marked A and B, then asked my brother-in-law (Brian) to pour the samples into the cups without letting any of us know which was which. We started by smelling the samples. 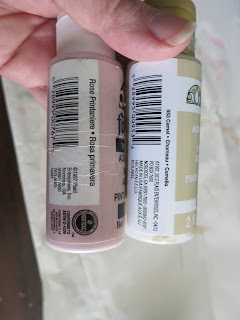 Sample A had a much stronger smell than Sample B; both smell like bubblegum, but A was so much more intense. Their appearance was the same. On to tasting. I noticed an immediate difference. Sample A was creamier, had a stronger taste, and was tastier than Sample B. Others added that Sample A was more robust, sweeter, and fruitier than Sample B. One person thought Sample B was more carbonated, but no one else noticed that. We each selected our favorite... all the way around the table, all six people chose Sample A. Those of us who had tried the regular Big Red felt confident that it was Sample A. It tasted just as we remembered it tasting: creamy, sweet, intense, and fruity. Sample B was good, but it paled in comparison with Sample A, so that must have been the new-to-us vintage version. We called in Brian to reveal which soda was which. We were all wrong. The version we overwhelmingly preferred was not the version we'd had before, but rather the limited-edition Big Red with real sugar. Fascinating! Thank you to Amanda and Big Red for the soda. You make an excellent product. If you ever need a taster, you know where to find me. 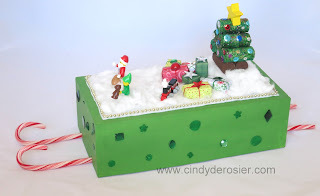 Have you ever heard of a shoebox float? They've been showing up as craft categories at county fairs recently. 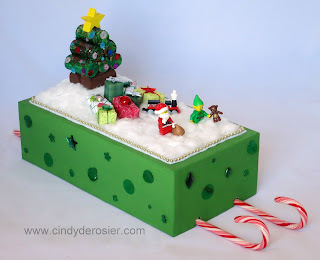 Basically, you turn a standard shoebox into a themed parade float. While I've seen them before, this was my first time making one. I decided to go with a Christmas theme by turning the whole float into a sleigh. 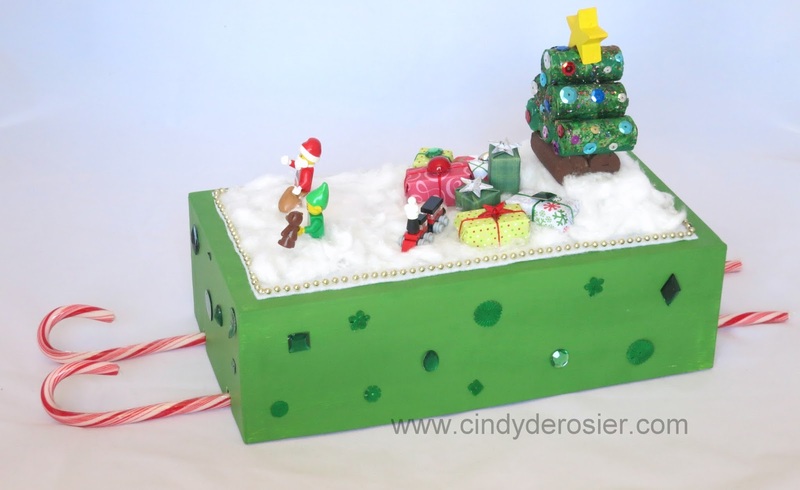 I started with a coat of gesso, then painted the shoebox a Christmas green. I cut tabs in the box and glued candy canes in the front and back to make sleigh runners. I glued random green sequins on each side of the box. I cut a piece of white felt just smaller than the top of the float and glued it down. I trimmed it with gold beads, then glued cotton balls in place to make snow. I added a cork Christmas tree with a wooden star on top. I raided Trevor's Legos and borrowed Santa, the elf and the train. They're held in place with Glue Dots. I tried a bunch of different techniques to make the presents before settling on something that worked well. I used scraps of patterned paper to wrap large dice and small blocks. 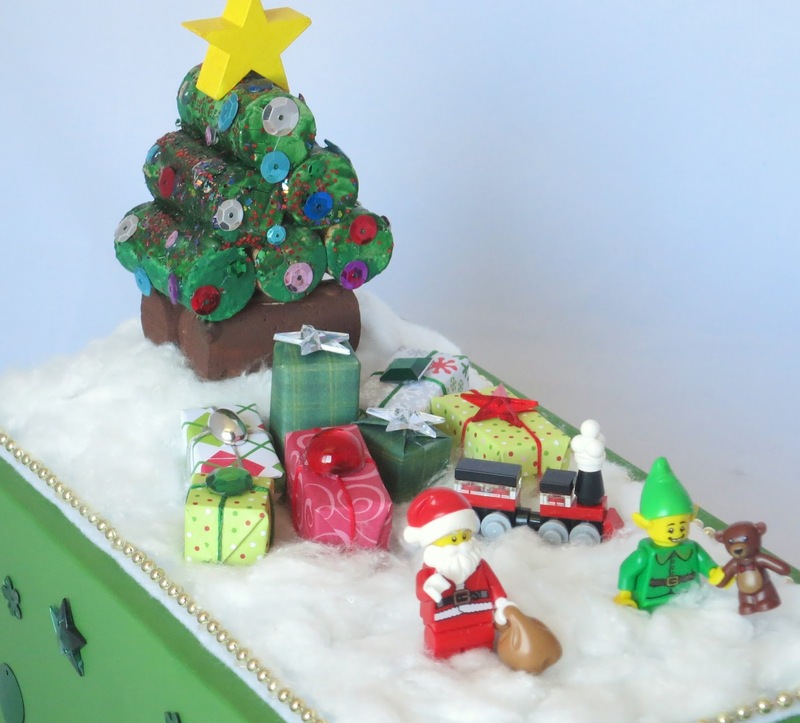 I added an embroidery floss ribbon to most of the gifts, then topped them with a plastic gem. Here's another look at the float, with a better view of the sleigh runners. I'm really happy with how this came out. I definitely see more shoebox floats in my future. One of the best parts of my Fun Family Crafts job is getting to see so many cool kids' crafts. Almost every day a submission comes in that makes me want to stop working and immediately zip into the craft room to create. I can't always do that, of course. It's often days, weeks or months before I actually make the project that inspired me. And in that amount of time, the project morphs from the original inspiration into something quite different. As you can see, it is entirely different from the inspiration piece! I only used a single paper plate and didn't use aluminum foil at all. I'm really happy with how it turned out. 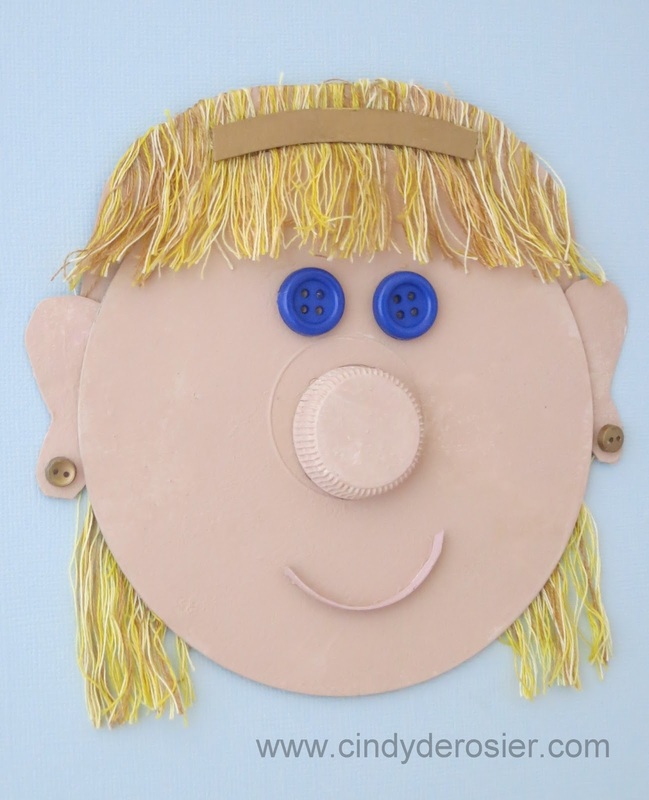 Cut a circle of chipboard the size you want Earth to be. 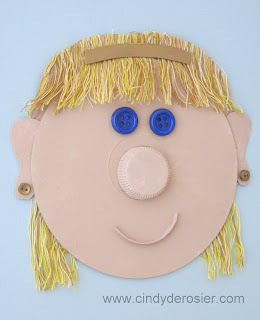 Put a coat of gesso on both the chipboard circle and the paper plate. 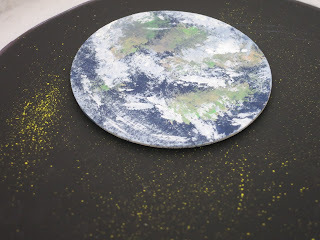 When that is dry, but a coat of black paint on the inside portion of the paper plate. Use the stencil brush (or an old toothbrush) to splatter bits of yellow paint onto the black. Set it aside to dry. Time to paint Earth. I used four colors: dark blue, tan, green and white, in that order. Start by painting dark blue on the entire circle. Add areas of tan and green to suggest the shapes of the continents. No need to perfectly replicate their shapes, though I did consult some NASA images before painting. 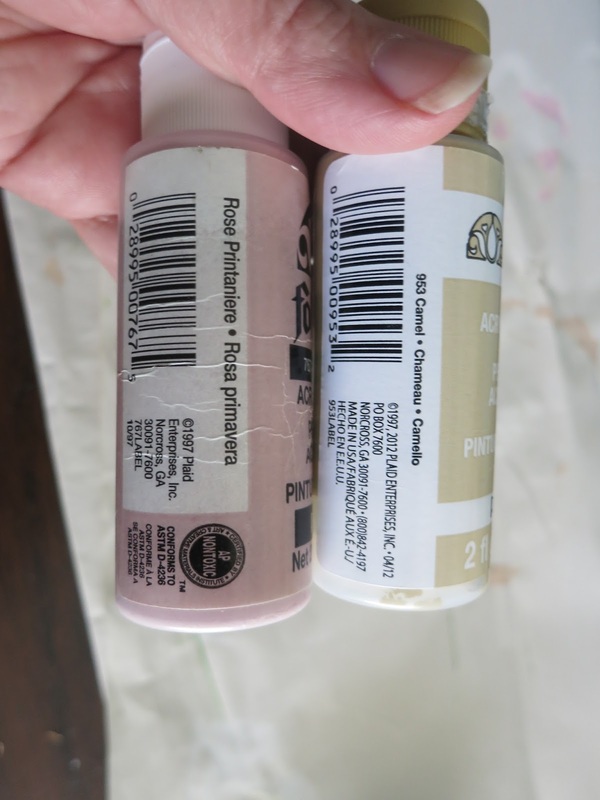 Use a stiff, dry brush to add white haphazardly over the other colors. 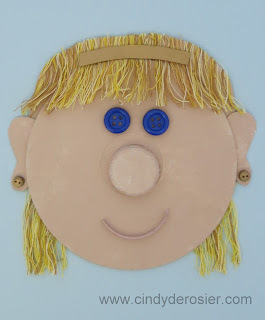 When that is dry, use foam adhesive dots to attach it to the paper plate. 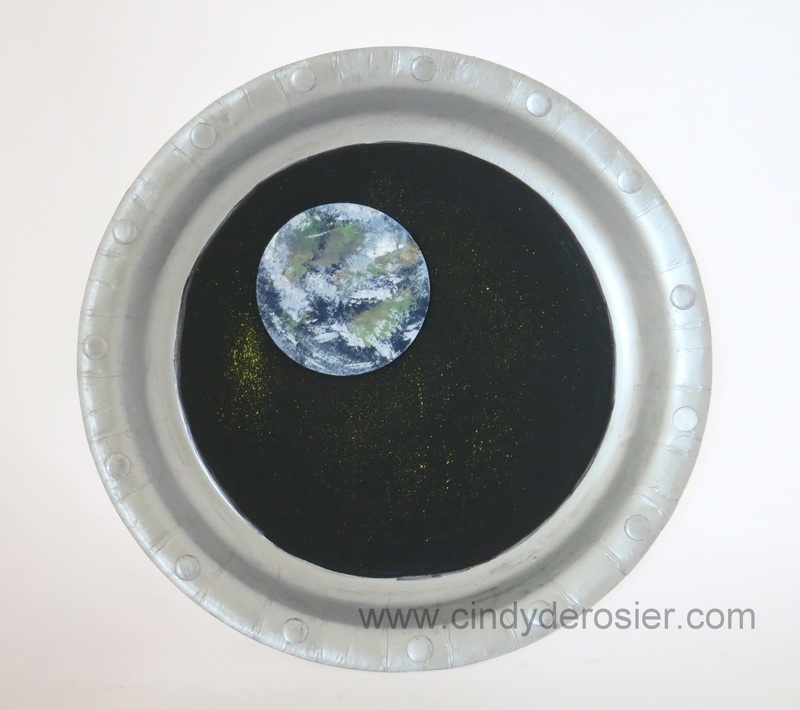 Paint the edge of the paper plate silver, being careful to create a crisp line between the silver and the black. While the paint is drying, punch holes from cardstock. Color them with the silver Sharpie. 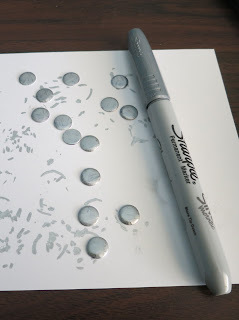 Glue these to the silver portion of the paper plate to create the rivets on the porthole. As a judge at the county fair, I am ineligible from entering any category that I judge, for obvious reasons. Therefore, I'm always on the lookout for interesting categories to enter that are outside my official areas of expertise. So when I saw a fair contest called 'Follow That Recipe' I was totally onboard. 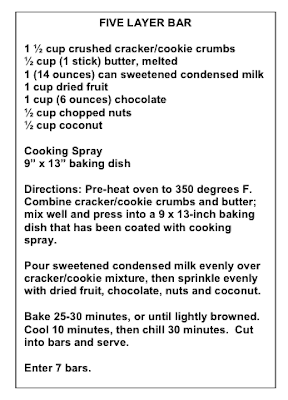 The concept is that everyone follows the same recipe for bar cookies, exactly as it is printed. You cannot alter the proportions or the cooking time, nor can you add or subtract ingredients. You do, however, get to select the specific items for your recipe. For example, the recipe calls for 1 c. chopped nuts, but it is up to each contestant to choose what type of nuts to use and how finely to chop them. There are four items in the recipe like that. In addition to nuts, each contestant can select what cookie or cracker crumb crust to make, what dried fruit(s) to add, and what type and format of chocolate to add. I had some ideas. To confirm that I was on the right track, I polled my Facebook friends. Based on their input, I decided to create two test batches. I made a quick judging form and asked friends to vote between the two cookie samples, without telling them what was in each. The results were interesting, but not very helpful! By the way, not everyone voted in every category. Now I'm more unsure than ever! I did hear from my tasters that both versions were really good, so maybe I can't go wrong. There's no way to know what the judges' personal tastes will be, nor whether they're looking for something traditional and delicious or totally out of the box.